Baking with Melissa™: (Easy) Saint Patrick's Day Cupcakes!!! 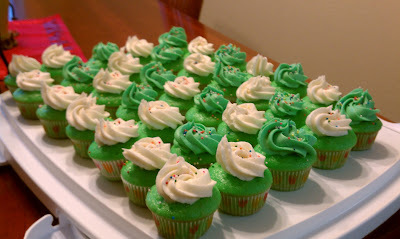 (Easy) Saint Patrick's Day Cupcakes!!! I love the color GREEN! And I LOVE buttercream frosting!! Yum! I have been looking at drooling over various bloggers all week creating the most beautiful sweet treats for Saint Patrick's Day and decided I wanted to join in on the fun! Here is an easy "almost homemade" cupcake recipe! These cupcakes turned out so moist and wonderful, your guests will never know that they are only "almost homemade"! Slowly add in powdered sugar one cup at a time and add in salt, vanilla and add milk as needed. Note: I split my frosting in half and added some green food coloring to it and left the rest white. I used a piping bag and a Wilton STAR TIP 1M to apply my icing, but you can frost them any way you like! I made this YOUTUBE FROSTING TUTORIAL for you in case you want some lessons on how to do this yourself! Don't forget to add the sprinkles!